InterContinental Kuala Lumpur heralded the arrival of its new Executive Chef Darrell J. O’Neill with a preview cocktail themed An Evening Under The Stars; giving a group of specially invited guests (yours truly included!) a taste of what's to come under his stewardship. Having honed his skills under Nobu Matsuhisa and an avid fan of Japanese cuisine, O'Neill showed his artful balancing of delicate flavours and textures in the Edamame and Mint Gazpacho with Hand Dived Scallops, and Cauliflower Espuma with Citrus Lobster and Caviar. The first was superbly memorable; sweet, tender scallops (hand dived means they're sustainably harvested) perked up by a cool, slightly nutty-beany gazpacho...I will never underestimate my snacking staple of those green soya beans ever again! The latter was simply to-die-for with the frothy cauliflower foam lending an effervescent touch to the sweet lobster meat (spiked with hints of yuzu) and briny caviar globules. 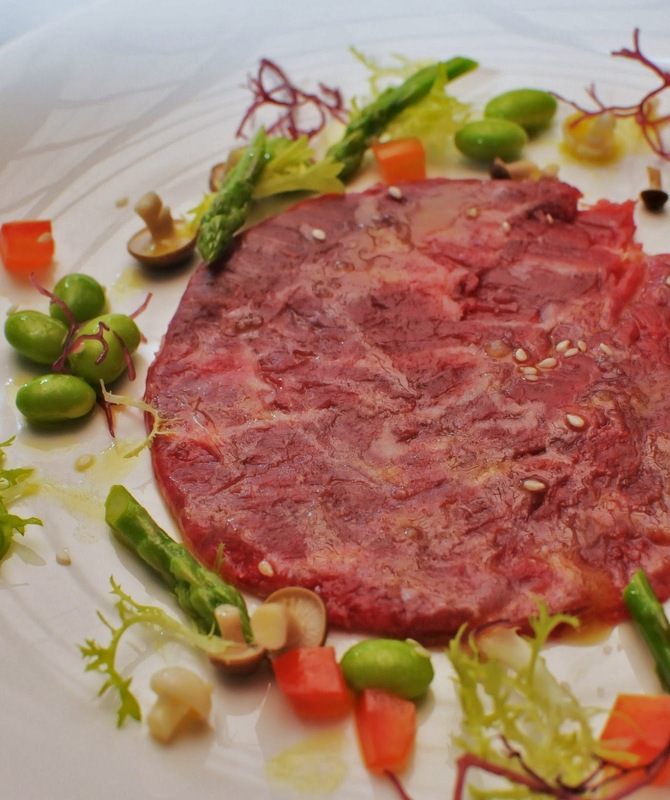 If you're averse to raw beef, perhaps the chef's ingenious wagyu carpaccio will make a convert out of you yet. Served with a scattering of tiny shimeiji, tendrils of purple seaweed, asparagus spears and micro greens, and drizzled with a sublime citrusy dressing, I certainly had no beef with the speciality and licked the plate clean! Taking a leaf out of his previous 'sifu's' (master's) book, O'Neill went all out to fish for compliments with a second main course that had a slab of black cod fillet laid out on an impossibly light sweet potato and ginger mousseline. 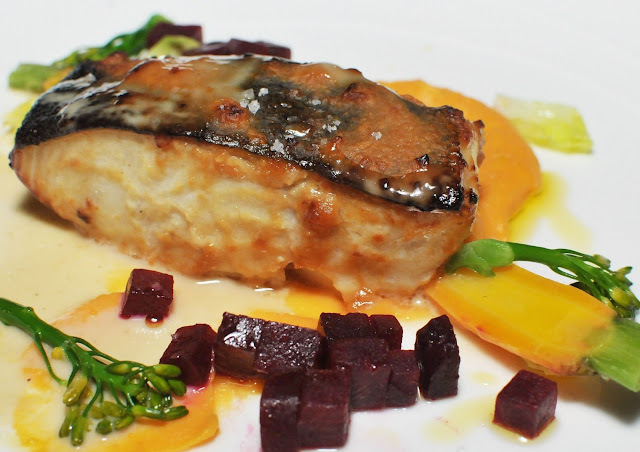 The fish's inherent sweetness was enhanced further by the baby beets while crunchy stalks of broccolini lent textural contrast. Definitely a dish that we fell for hook, line and sinker. Bringing the curtains down on a high, the chef whipped up a potent three liqueur Sabayon (teetotalers don't know what they missed!) for his Modern Coconut Tartufo (a typical Italian ice cream dessert). Believe me, coconut ice cream and diced mango haven't tasted sooo good before! A wafer-thin disc of chocolate flecked with gold accents just made it a luxurious treat to round off the amazing chef's debut! I love yam cake! So do my family and countless friends who share an ardent love for this simple, traditional delight. When Babe KL invited me to be part of her virtual 55th Merdeka Open House themed Uniquely Malaysia, I thought yam cake fits the bill. After all, I haven't seen yam cake sold in any other country except perhaps in Singapore? I first learned to make it in 2009 after my Mom revealed her yearning for this humble but tasty treat. You can buy yam cake from certain stalls in the local pasar (market) and a handful of restaurants but we found that most of them barely have any yam in it. Don't know about you but I prefer my yam cake with just the right consistency studded with visible yam dices. I also hate it when the topping is bare frills at best with a stingy sprinkling of chopped spring onion, chilli and fried shallot. So I resorted to make yam cake at home and it turned out to be easier than I thought! For those of you who want to try your hand at making it - here's the recipe which I have adapted slightly from Rohani Jelani's recipe book called Hawker's Favourites. Last year I made pans of yam cake for sale, to raise funds for a friend's Climb of Hope where all proceeds went to National Cancer Society. Hmmm...perhaps it's time I make some in celebration of our 55 years of Merdeka. Peel skin from yam and cut into dices. Steam yam dices over boiling heat for 20-30 minutes until soft. Once ready, remove and set aside. Slice shallot and saute with dried prawns until shallot turns slightly brown. Add in yam dices and stir-fry quickly. Add salt, five-spice and pepper powder. Stir evenly and remove from heat. Mix rice flour, tapioca flour and water in a pot until mixture is lump-free. Add in alkali water and stir evenly. Cook mixture over low heat, stirring frequently until batter thickens into custard-like consistency. Add in yam dices into the batter and mix everything thoroughly. Pour into a metal cake pan and even out the surface. Steam yam cake over high heat for 30 minutes until cooked. Once ready, turn off heat and remove yam cake from steamer to cool. Sprinkle garnishing ingredients on top of yam cake once it has cooled down completely. Cut into diamond-shaped squares to serve. To make sauce, mix taucheo with sugar and water. Heat a little oil in pan and pour in mixture. Bring to boil. Stir until sugar has dissolved and remove from heat. Serve with yam cake. Time flies when you're having fun...it sure seems that way for chef turned restaurateur Frankie Woo whose Gu Yue Tien restaurant will be celebrating its 8th year in our local cut-throat Chinese restaurant scene. Having left the safe confines of employment of international hotel chains all those years ago, Frankie has worked tirelessly to carve his own niche in the F&B business and succeeded to some extent; drawing a loyal clientele (including luminaries such as Datuk Michelle Yeoh and fiance, Datuk Jean Todt in the past) who return time and again to sample his culinary masterpieces. To mark Gu Yue Tien's 8th anniversary, Frankie has drawn up a nostalgic menu priced at RM88++ per person which will run from August until end September, taking his customers on a retrospective culinary trip down memory lane. Instead of the ubiquitous four seasons platter that raises the curtain for most banquets, Frankie pulls out the stops by serving eight types of appetisers in keeping with the auspicious occasion. In order to derive full satisfaction from them, he recommends starting with the Salad Cucumber with Chicken Floss first. discs came adorn with mounds of crisp chicken floss. Popping each thickly cut disc into our mouths, the cucumber's crunchiness melds nicely with the accompanying smooth, creamy and feathery textures. 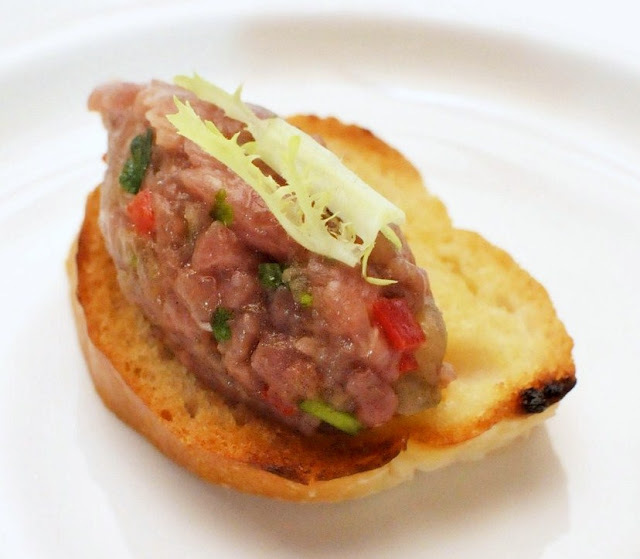 Ramping up the flavour quotient a little is Sliced Pig's Neck Meat Rolled with Shredded Cucumber and Hot Bean Sauce; another irresistible pairing that has tender slices of thin pig's neck meat and julienne of crunchy cucumber livened up with a little dollop of robust hot bean sauce. Moving on, the Foie Gras Mousse on Toast bears testimony to the chef's fondness for global influences in his own culinary endeavours. Happily devouring the crispy toast pieces topped with velvety smooth slices of foie gras and nectar-sweet mango dices, we certainly had no complaints about the rich, dense and indulgent combination. If you have parents who grew up in the 1960s, they'd tell you that hai chou or crab meat dumpling is all the rage then in Chinese restaurants. Now diners will get a chance to relive that nostalgic treat as Frankie has included Deep Fried Crab Meat Ball into his celebratory repertoire. I love sinking my teeth into the crackling crisp outer skin and sampling the milieu of ingredients within: shredded carrot, celery, water chestnuts and crab meat - all subtly scented with five spice powder. So yummy! A piquant chilli paste accentuated with fresh kalamansi lime juice adds a fiery dimension to the slices of Cold (poached) Chicken and Jelly Fish. This was a popular offering for many banquet appetiser platters in the 1970s so it was a delight to relish it again after so long. Springy succulent prawns filled the crunchy parcels of Deep Fried Prawn Dumplings; a perennial favourite that few diners would ever tire of. The Fried White Bait with Salted Egg Yolk presented in a fine filigree vermicelli nest is wickedly addictive; we find ourselves hooked the minute the first briny, crunchy morsel passed our lips. Dark and smooth with firm jelly-like texture, Century Egg wedges complemented with Japanese pink ginger pickles complete the starting appetiser line-up. A time-honoured method of preserving duck (and sometimes chicken and quail) eggs, the eggs are preserved in a mixture of clay, ash, salt, lime and rice hulls for several months. You either love or hate them; the dark grayish-green yolks yield a sulfuric nuance while the whites take on a translucent, brownish-black hue and bouncy texture. Conscious of these politically correct times, Frankie has done away with sharks' fin soup and opted instead to feature Braised Seafood Soup with Crab Roe. The viscous broth tastes just as good, chockful with assorted shellfish, wisps of beaten egg and diced beancurd. One of the dishes that made Frankie famous is his Charred Rack of Lamb; a meaty, slightly sweet and smoky delight that will have you picking the bone clean. For those who prefer something porcine, there's Salt Baked Iberico Spare Ribs in place of lamb. It's difficult to decide which aspect of the Fried Fresh Water Prawns with Spicy Sauce we like more - the inherent sweetness of the crustaceans themselves or the lusty, complex sweet, tangy sauce that they were bathed in. Don't worry about letting the superb sauce goes to waste; the dish comes which a plate of thin, rectagular toast slices for you to mop up every drop of the delectable gravy. Bright, robust Hunanese flavours dominate the showpiece of Hunan-style Steamed Seasonal Live Fish. Despite the pungent pairing of minced chilli and garlic, the natural sweetness of the hybrid fish (cross between patin and pak sou koong, a specie of catfish) remains discernible. The doneness is spot on too and to soak up all the flavourful fish jus that's pooled in the plate, we had some blanched bee hoon (rice vermicelli) to soak up the delicious liquid. Dinner finishes on a light, sweet and cool note - a glass of Chilled Sea Coconut with Longan and Sliced Lime to cleanse the palate and round up the meal on a high note. Here's to another eight and more years in the Chinese culinary realm, Frankie! Gu Yue Tien’s 8th Anniversary special menu is available from now until September 30. For reservations, call 03-2148 0808. The restaurant is located at Lot 5A Chulan Square, Jalan Raja Chulan, Kuala Lumpur.